Are you on the clutter carousel? Do you mindlessly acquire things you hardly ever use without even thinking about it? Well it’s time to step off, because once you’re on the clutter carousel then you’re going nowhere fast. What is The Clutter Carousel? One example of the kind of mindless behaviour which keeps us circling around our clutter is to automatically replace items when they break, regardless of whether we actually use them. Yesterday my microwave broke and my first thought was that I’d have to go and purchase another one; but then I stopped to think. The microwave takes up a lot of counter space in my kitchen, is fiddly to clean, and I would have to spend a minimum of thirty pounds to replace it. I use my microwave for heating baked beans and baked potatoes. I never use it for anything else. So does it justify the space it takes up, the time spent in shopping for a new one, and the thirty pounds I would have to spend to replace it? I think not. The broken microwave is destined for the recycling centre and I’m already planning what I can use my new kitchen counter space for. How many broken gadgets do you replace that are so little used you could easily manage without them? Do they really need replacing? Or could you find a better use for your space, time and money? And let’s not confine this exercise to broken gadgets. What about the perfectly good items which you rarely or never use? Just because they work doesn’t mean that they deserve the prime spot they occupy in your kitchen. Why not sell them and gain money as well as space? Look around your kitchen, and your home as a whole, and identify all the possessions which you rarely use. If you could do with extra cash (and let’s face it who couldn’t these days!) then why not free your home from the presence of these squatters? Unused items are doing nobody any good whilst items which gets used twice a year don’t really justify their position either. There could be someone out there who would love, cherish and use your unused possessions. Whilst you could be gaining some spare cash to buy something you really would benefit from. Or better still, put the money towards a holiday or a rainy day. 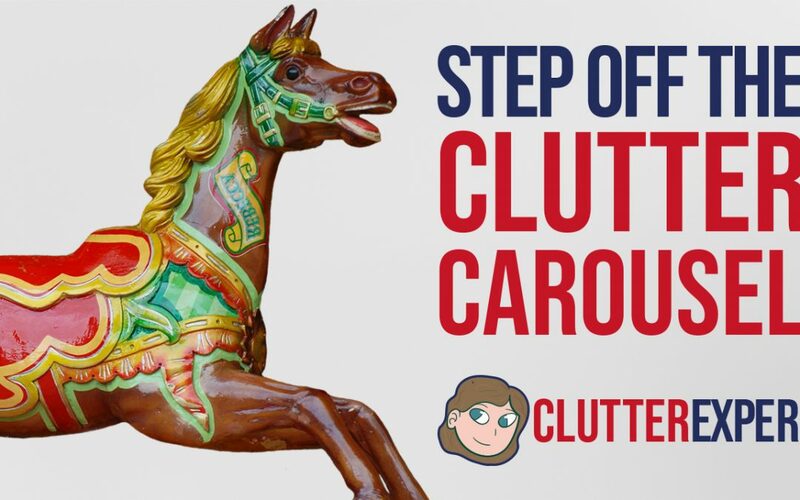 Step off the clutter carousel; stop mindlessly acquiring and keeping clutter and think about what you actually use and what you actually need. Then you can start to travel in the right direction, instead of circling around your clutter like a dog chasing it’s tail.